Diabetic retinopathy affects—as the name tells us—the retina, a layer of the back of the eyeball (also called fundus). In this section, we describe briefly its anatomy. • Sclera: The tough outer part of the eye. • Choroid: A spongy layer filled with blood vessels. Its main function is to nourish the retina. • Retina: The innermost layer of the eyeball. Place where the image created by the lens is focused and transformed into nerve impulses which are then sent to the brain via the optic nerve. The retina itself can be divided into two layers: The photoreceptor layer and the pigment epithelium (sometimes, the latter one is introduced not as a part of the retina, but as a layer of its own). The pigment epithelium has metabolic functions; it lies between the photoreceptor layer and the choroid and it is densely packed with pigment granules. The cells responsible for the transformation of light into nerve impulses are the rods and the cones. They are not distributed uniformly on the retina: The concentration of the cones—responsible for daylight vision—is maximal in the macula, the center of vision. Once the light has been transformed into a nerve impulse, the information has to be transported to the brain. This is done by the optic nerve that enters the eye by the optic disk (or papilla). 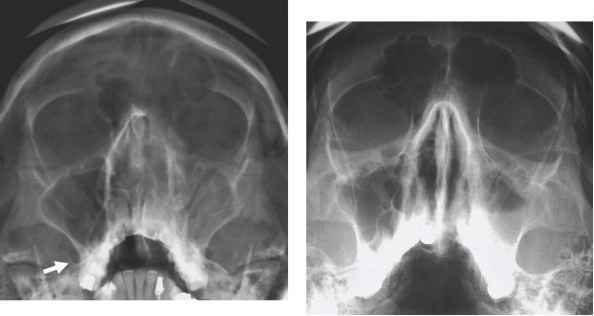 The papilla does not contain any photoreceptor; it is also called the blind spot. 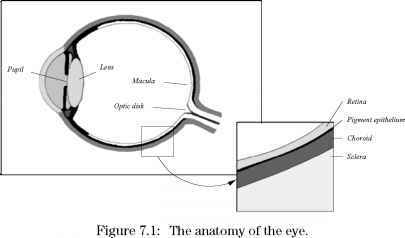 The retinal vessels that nourish the retinal tissue also enter by the optic disk: Only the macula is exclusively nourished by the choroidal layer and is therefore not vascularized. These three features—the macula, the papilla, and the vascular tree—are the main anatomical features of the retina. The retina can be seen as an exterior part of the brain; it is highly specialized and complicated. There are many diseases that can affect this part of the eye and one of the most important is diabetic retinopathy.